Olbia in Thrace, bronze dolphin coin. Date : 4th to 5th century BC (the dating of these is not 100% certain). Denomination : Bronze Dolphin (the exact denomination is not known). Size : 28.0 mm long. Weight : 1.67 grams. 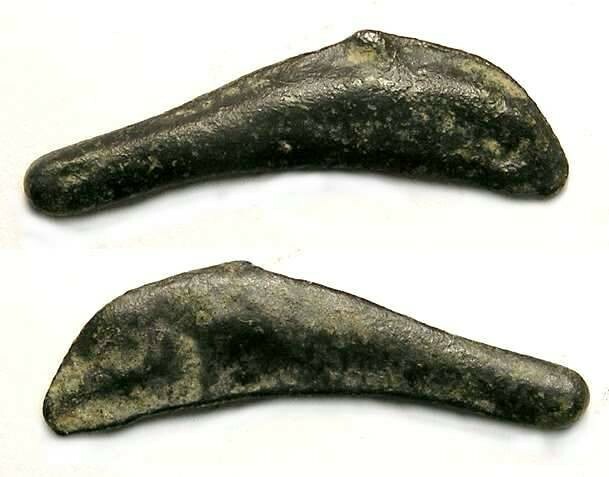 Shaped like Dolphins, there is no real doubt these cast bronzes were used as an early form of money. This type has no inscriptions (there are some scarce types with moneyer's names on them) but there is no doubt the were issued from Olbia in Thrace.